Terrapin Outdoor Center The Original! TOC Inventory - Canoes, Kayaks, SUP's, Paddles, PFD's, Paddling Accessories, and Climbing Equipment! Store Hours - Visit TOC in-person and check out our HUGE selection of new canoes, kayaks, and more! Open year-round. Rentals - Come float Terrapin Creek! We rent canoes & kayaks. Shuttle service included! Shuttle Service - Bring Your Own Boat! We'll transport you and your boat during your visit to Terrapin Creek! Advance reservations recommended. Repairs & Outfitting - We do canoe & kayak repairs, outfitting, modifications, and install skid plate kits. Map - Where in the world is Terrapin Outdoor Center and Piedmont, AL? Driving Directions - How do I get to TOC? Weather - Forecast for Piedmont, AL. Radar - Current weather radar image of Alabama. Water Level - Current flow-rate & height of Terrapin Creek as recorded by the USGS. Links - Local food, fun, lodging, and more! We Buy Used Boats! - TOC will buy ($$$) your quality used canoe or kayak. Contact us! Wholesale Pricing - New canoes, kayaks, and gear at wholesale prices! Available to qualifying outfitters, camps, schools, churches, organizations, and similar. Please inquire. Wanna Become an Outfitter? - We're always happy to help new outfitters get up & going with new boats & gear at incredible pricing! Just ask. Terrapin Outdoor Center is located on the beautiful Terrapin Creek in Piedmont, AL and is "Alabama's Largest Paddle Sports Retailer & #1 Kayaking Destination"! Family owned & operated with over 45 years of experience in outdoor retail sales. Our showroom is overflowing with new canoes, kayaks, SUP's, paddles, PFD's, and accessories from the top names in the industry: Jackson Kayak, Wilderness Systems, Bonafide Kayaks, Old Town, Dagger, Perception, Mad River, Ocean Kayak, Wenonah, Current Designs, Aqua Bound, Bending Branches, Werner Paddles, Adventure Technology, Carlisle Paddles, Astral, Stohlquist, Harmony, Orion Coolers, NRS, Yakima, Black Diamond, and more! So whatever your paddling preference: solo, tandem, whitewater, flatwater, tripping, touring, fishing, recreational, racing, etc., we've got the boat and gear that'll be just right for you. And here at TOC, you can always expect fast, friendly, courteous service, knowledgeable advice . . . and a good deal! 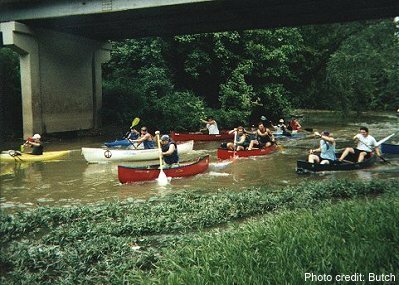 We also rent canoes & kayaks and are "The Original" outfitter on Terrapin Creek since 1995! There's nothing better than a quiet, peaceful float down Terrapin Creek. Clean, clear water, beautiful scenery, great fishing, wildlife, and enough moving water to keep things interesting. Everyone is welcome! Individuals, small groups, large groups, families, churches, schools, scouts, military, law enforcement, businesses, companies, corporations, organizations, etc. Call to arrange a trip. Don't forget to ask about our group discount rates, and the "Early Turtle Special", and save $$$! *Please always visit our Facebook Page for the latest, most up-to-date info ... or if this website is down or has not been updated in a while. Send e-mail to Terrapin Outdoor Center with questions or comments about this site. Copyright © 1995-2018 Terrapin Outdoor Center.